Since the release of SiT 3.60 LTS around a week ago, we’ve have some news for you. A new version of our VMware is out, and not only that, we’ve gotten a spot at the VMware appliance market where you have easy access from your VMware Player or Server, or you can download it from the link in the wiki. There is a great activity in the plugins directory these days. Some nice new Dashlets but also the Fonts plugin which gives correct symbols for charts for non latin characters. A lot of the Plugins created by Nicdev007 has been updated, I suggest you try them out. 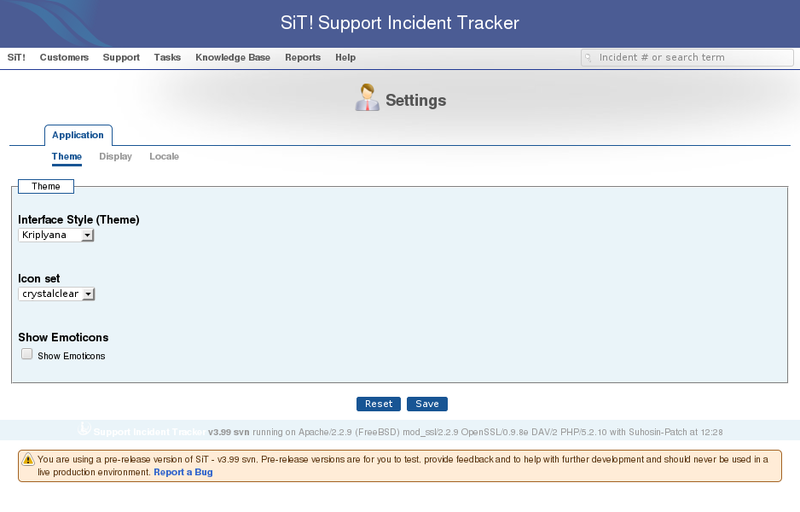 Some of you might have noticed that we’ve added translation bars on the SiT webpage. This will hopefully boost translations a bit. We are also working on an online page where you can translate SiT without the needs to access your own site. Saturday the 10th of April, we are going to make an overhaul on the documentation take a look on our agenda. If you feel something is missing, feel free to join us on IRC and discuss it with us. For easy access, use the Webbased IRC. You might also ask us in our forum. v3.61 LTS, which is planned to be released by the end of May. This release will contain mostly bugfixes. v4.0 Is still under development, but the plan is to release it sometime in the fall, September month has been mentioned but thats still unofficial. I have a question regarding the Incident tracker. I would like to illustrate with an example here. A company is using SIT. A client of that company is browsing the SIT. 1. Does client have permission to browse Knowledge Base? if yes, how? 2. Will client have permission to download files which are kept by the company? If yes, how? 1. Yes, clients (contacts in SiT! terminology) can browse the Knowledge Base by using the Portal – see the Portal tab of the Configuration page within SiT! to enable this. 2. If a file is attached to an incident then yes, a client will be able to download the file from the portal.